You’re using continuous integration, right? If not, you really should. And you should probably set it up to email you if the build breaks. But there’s a nice way to get notification right on your OS X desktop: it’s CCMenu. 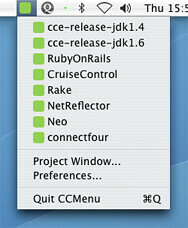 CCMenu is a menu item for OS X that displays the status of your projects that are being built with CruiseControl. It works with CruiseControl.rb as well which you can use for your Ruby on Rails projects, which is where I mainly use it. When your projects are good, it shows a green rounded square and when your projects break, it shows a red one. It also uses Growl to notify you whenever there is a status update on any of your projecs. Its freeware and available thanks to Erik Doernenburg. One tip: you can have it start up automatically by going to System Preferences > Accounts > Login Items and adding CCMenu and then checking the checkbox. Perhaps that will be a preference in the future, but for now that works for me.